A trip to the Bay on a warm end of summer day was a great idea. It has been many years since we last visited the Calvert Cliffs in Maryland. Somewhat of a drive but well within reasonable to do in a day. The great thing about this park is the beach. You take a mile and half hike to the beach where you can explore the sand and water. If you're lucky you may find some great fossils. There we some very serious fossil hunters when we visited. They carried large buckets, shovels, and very sturdy sieves. We of course being us, carried nothing. Rookies. We were not there to seek an amazing fossil. We were there to enjoy the beach. 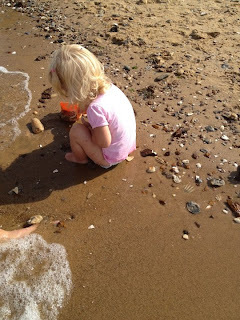 With plenty of shells scattering the shore there was plenty of great finds for us. It was liberating actually, the not obsessing, just exploring. 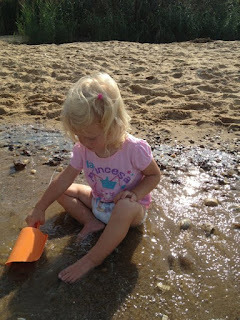 We walked the shore looking for interesting rocks or shells. Adelynn was perfectly happy digging in the sand. And lucky for her our arrival time was just as numerous people were heading home for the day. That meant there were a few abandoned shovels for us to use. Adelynn happily took a nice orange shovel to the water and found herself a good spot to dig. The girls scouted for shells or a possible fossil. Daddy kept an eye on Adelynn keeping her mostly dry. As the sun began to set the biting flies became more aggressive. Bug spray was not working. (Which is to me outrageous) Constant movement or being submerged were the only options. It wasn't long until the lot of us had enough of those terrible flies. We called it quits. It's terrible that we let those darn flies ruin our good time but they were awful. AWFUL! Paired with the humid heat it made for a really uncomfortable time. Silly us, we left our swimsuits at home, we were unprepared for the beach. The only person who had a blissful time was Adelynn. She was bug free thanks to a very protective Daddy who made sure those flies didn't get his baby. I was so glad to see her enjoying the beach letting the water come right up to her. Her previous experience at Virginia Beach was a little different. Taking the trail back to the park was long. It always feels long heading back. We chatted and listened and even got tired, or well, Adelynn did. She managed to get herself a good nap in Daddy's backpack carrier. Back at the parking lot it was time to get our hot dogs grilled. It was so hot and humid. Almost stifling hot it was for a late afternoon. While the kids played on the playground we prepared supper. Never ones to rush a meal this was the one meal we wanted to rush. It was the desire to sit someplace cool that motivated us to finish quickly. Thankfully we were also very hungry after a busy day. As we drove home we all talked about how fun it was to explore a natural beach. Sure we were not having favorable thoughts about those flies but that was the only negative we could determine. Certainly a great trip. It's one that we should do again sometime in the late, late fall when those biting flies are too cold to cause trouble.